Once you register for the online parent certification training you will have instant access to the first 8 hours of the training. It is an online course, available 24 hours a day, from any Internet enabled device. Immediately after you register, we will send you via USPS Priority Mail a packet, which will include all the training materials you need to complete the remaining 32 hours of the certification. 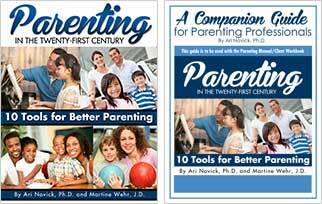 This will include a complementary copy of our Parent Workbook, Parenting in the Twenty-First Century, 10 Tools for Better Parenting, The Companion Guide for parenting professionals, which will teach you everything you need know about starting your own parenting classes. 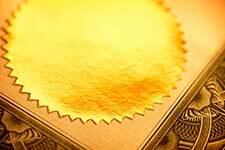 Also included are ancillary materials, such as sample certificates, order forms, and the required final exam. 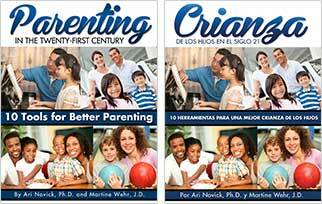 We offer our popular client workbook, "Parenting in the Twenty-first Century, 10 Tools for Better Parenting" in both Spanish and English. All students must use client workbooks when they participate in classes. Certified providers can get up to 30% off workbooks. Reselling of workbooks can add to your profit margin and be a great way to increase your business. Copying of workbooks is not permitted. Click here for volume discounts on Workbooks. Need help with your certification training? Want expert advice on setting up your parenting classes? Our office is open 9am-5pm, Monday–Friday to help answer all of your questions. Email support is available 7 days a week! Added To Our Exclusive Provider List, Free! 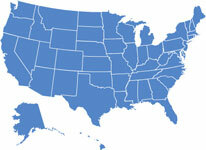 Once you complete the 40 hours of training, you will be listed on our provider list as a certified parent instructor. Anyone searching for classes in your area will be able to find your information here and contact you directly. If you have a website, we will also list your website for free. Once your 40 hours of training is complete, you will be issued a Certificate showing you are now a "Certified Parent Instructor" through the AJ Novick Group, Inc. The certification is valid for 2 years. At the 2 year marker, you will be notified to complete a short 4 hour CEU course to keep your certificate current.